The Discovery Channel isn't known for premiering heavily buzzed-about films. But when there comes a documentary about a grizzly bear enthusiast's death at the claws of his beloved beasts, the cable network widely known for depicting fornicating mammals wastes no time laying claim to it. Veteran German director Werner Herzog's 2004 documentary "Grizzly Man," which won an Alfred P. Sloan feature film prize not one year ago at the Sundance Film Festival, first aired on cable TV last Friday. Appended to the 106-minute film was a 30-minute round table comprised of friends of the film's referent subject, blond mop-headed animal rights activist Timothy Treadwell. The haste with which the film journeyed from the big screen to the small one demonstrates not only "Grizzly Man's" smooth fit within the Discovery Channel's programming canon, but also the mesmerizing power of the tale Herzog crafts from Treadwell's life and death. The documentary itself is flawless. Herzog deserves infinite praise for refusing to play the audio of Treadwell and girlfriend Amie Huguenard's savage demise by a surly grizzly bear. The roundtable of Treadwell's closest friends and associates lament the morbid fascination with which viewers inquire about this record of Treadwell and Huguenard's deaths. Although it's easy to join in the condemnation of humanity's fixation with violence, it's difficult to deny harboring any curiosity about the soundtrack to two people being slaughtered by a grizzly bear. Ultimately, Herzog's sensitivity to Treadwell's former girlfriend (who possessed and refused to listen to the audio) and the nature activist's surviving loved ones is worth far more than the fleeting thrill of listening to limbs being ripped from torsos. But what was his and Huguenard's death like, you ask? Just use your imagination. Herzog attempts to shift the focus from Treadwell's tragic death to his life as a frequent summer vacationer in Alaska surrounded by grizzly bears and foxes. Here, Herzog uses bits of the 100-plus hours of footage Treadwell shot in the lush locale that depicts him admiring bear behavior from not so afar and even stopping to marvel at their mounds of feces. All the while, interviews with Treadwell's friends and family are used to help Herzog demonstrate that Treadwell not only earnestly longed to live among the bears, but also to become one. Herzog even provides a philosophical counterpoint to the chipper Treadwell. The director remarks in his minimally clunky German accent that nature is not the beautiful utopia Treadwell perceived, but rather a harsh realm ruled by primal instincts and brute force. Still, his commentary is offered only as an aside and not an encompassing frame for Treadwell's tale. Herzog is respectful enough a documentarian to not make "Grizzly Man" into his film. We have Michael Moore to pull that kind of stunt. While Herzog's filmmaking is beyond reproach, Treadwell himself is not. At first glance his tremendous passion for bears and all wildlife is admirable - a captivating portrait of a deep, star-crossed love - but upon examination, his behavior reveals a swollen ego stemming from fragile emotional soil. Almost all of Treadwell's video diaries of his adventures in the Alaskan terrain feature him prominently; he occupies the foreground while his beloved bears lumber about behind him. His appearance is a top priority to him - every jacket he wore in Alaska contained a comb and mirror in the front pocket. Even his friendship with Alaska's animals takes a backseat to his vanity when he shrilly berates a fox for stealing his "important" baseball hat. Then, in a subtle display of obliviousness, Treadwell alters the rock arrangement in a stream so that salmon may run it and fill the bellies of starving bears. Though benevolent on its own, this gesture betrays a hypocrisy within Treadwell, who frequently cites the absence of human intervention as a raison d'etre for his love of the Alaskan wilderness. Treadwell's most egregious behavior is captured when the bear activist boasts about his survival skills in the "Grizzly Maze." Poisoned by pride in his life's work, Treadwell challenges viewers to make the journey to the Alaskan wild. With the taunting tone of a schoolyard dare, he declares that no one could survive the experience. And a "survival of the fittest" contest in grizzly bear territory is relevant to the preservation of their beautiful species how? Here Treadwell comes off more as a pompous thrill-seeker whose death is not so much tragic as inevitable. 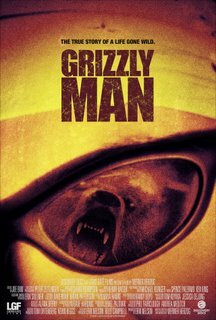 "Grizzly Man" thus inspires both sympathy for Treadwell's colossal love of nature and disdain for his eagerness to let the world know about it.